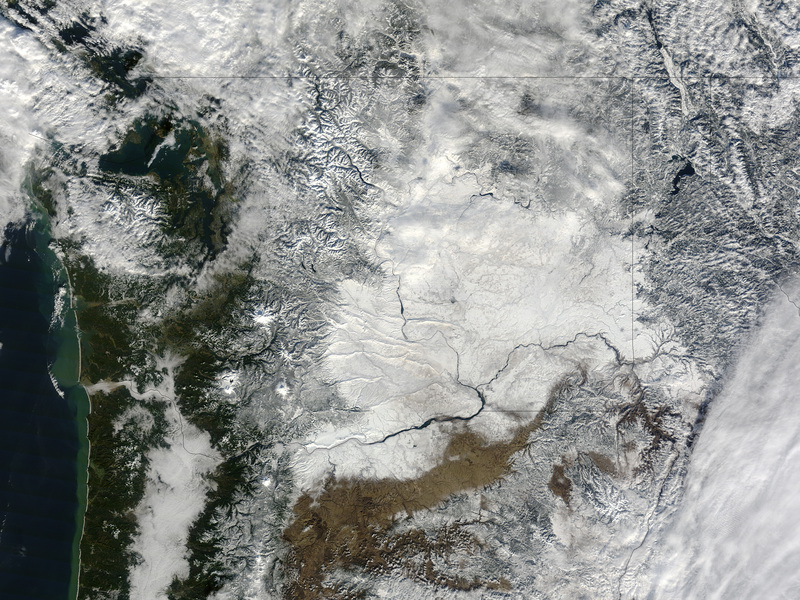 A severe winter storm pummeled the Pacific Northwest in late January 2012, icing roads, downing power lines, and prompting avalanche warnings. On January 20, more than 250,000 customers were without electricity, as utility crews struggled to restore power, news sources said. Rising temperatures and potential new rainfall raised the possibility of flooding in the days that followed. 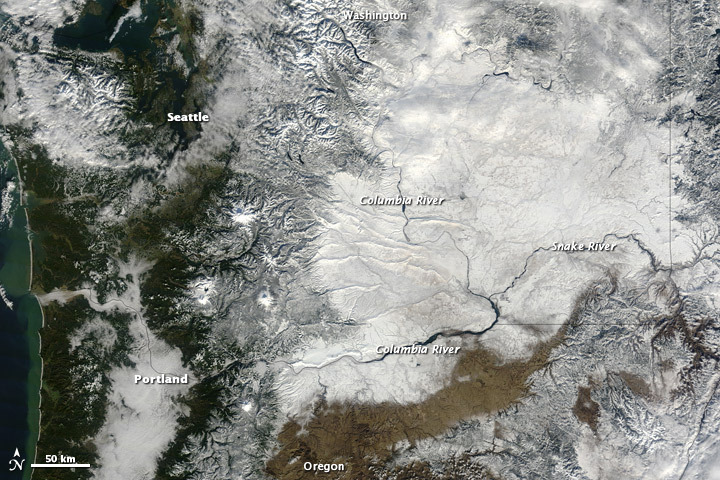 Snow still blanketed much of Washington state on January 23, 2012, when the Moderate Resolution Imaging Spectroradiometer (MODIS) on NASA’s Terra satellite captured these images. The top image is a natural-color scene similar to what our eyes would see from the sky. 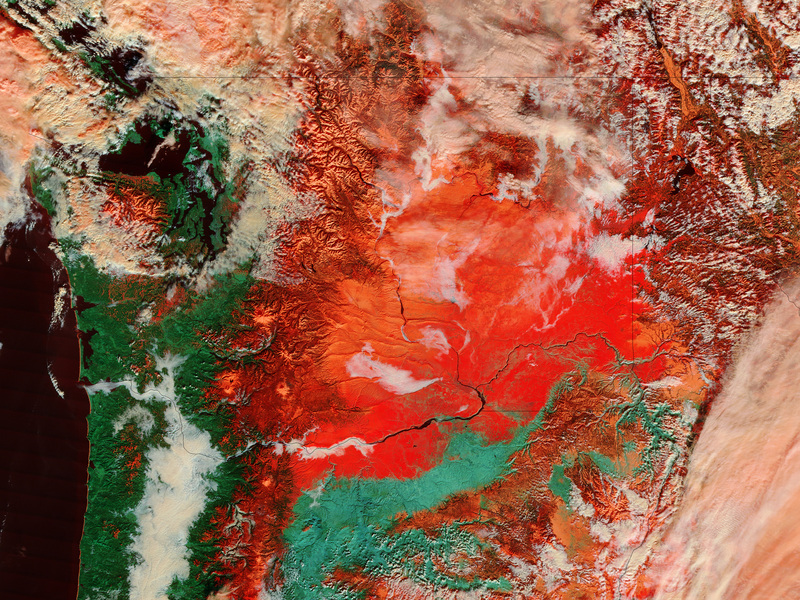 The bottom image is a false-color scene that better distinguishes between snow and clouds. Ice and snow are red. 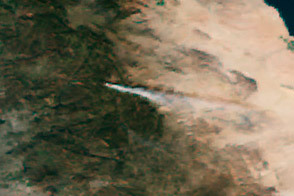 Liquid-water clouds are white, and ice clouds are peach. Vegetation is bright green. Snow blankets the region east of Seattle and Portland, stretching all the way to the Idaho border. In the band of forest along the Pacific Coast, snow may be more prevalent than it appears, as it is sometimes hidden from satellite imagers by trees. Warmer air blew into the region soon after the storm, adding to hazardous conditions. Flooding closed roads and forced some residents into emergency shelters. On January 23, KVAL reported that a fresh storm was approaching the region and might drop several inches of rain. The National Weather Service issued a flood warning for the Portland area, as the new round of rain had the potential to push rivers into flood stage. 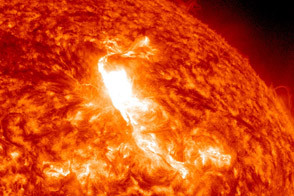 NASA images courtesy Jeff Schmaltz, LANCE/EOSDIS MODIS Rapid Response Team at NASA GSFC. Caption by Michon Scott. 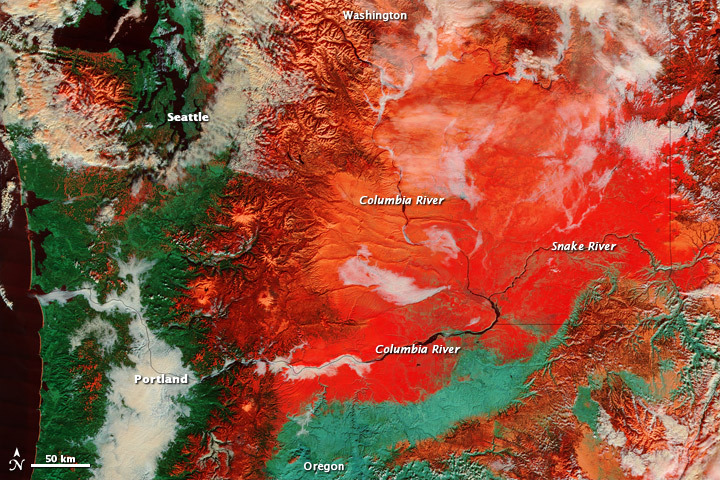 Natural- and false-color images provide two views of snow cover left by a severe winter storm in the Pacific Northwest. CNN Wire Staff. (2012, January 19). Flooding, avalanches, outages all effects of Northwest storm. Local10.com. Accessed January 24, 2012. Ho, V., Sunde, S. (2012, January 20). Floods may be next, thousands without power. SeattlePI. Accessed January 24, 2012. KVAL News. (2012, January 23). More floods possible. Accessed January 24, 2012. Historic Winter Storm Moves Across the U.S.